You are currently browsing the Lene og Marius bloggen blog archives for May, 2009. Tenkte jeg skulle lage en liste over morsomme nettsteder med diverse lenker. Selv syns jeg www.leenks.com er ett av de beste nettsteder for alt mulig. Break.com har masse vis av bilder og videoer. Verdt Ã¥ titte innom! Endelig fredag hos dagbladet er ogsÃ¥ verdt en liten titt. The Onion er jo en klassiker, den har blant annet vunnet beste humor nettsted. Dingz.no har ogsÃ¥ noen morsomme nyheter en gang i blant, som denne fjernkontrollen. Det meste finnes under dingz-nonsens, med alt fra stygge sko, svenskevitser, toalettpapir og iBoobs. Klikk.no kan ogsÃ¥ har noen morsomme historier, som denne om skrekk hotell, IKEA humor eller internett humor. Kom med forslag pÃ¥ andre morsomme nettsteder! Fixate your gaze on the center of one of the figures and stare at it for some time (20-30 seconds) while it cycles (without moving your eyes). After several iterations youâ€™ll start noticing that the empty outlines fill in with ghostly redish or bluish colors! These illusory colors are called â€œafterimagesâ€. Interestingly, the colors of the afterimages vary, which is puzzling because they come from the same original figure. Moreover, the shape of the outlines determines the filled-in color, which is complementary to the color of the same shape in the original figure. 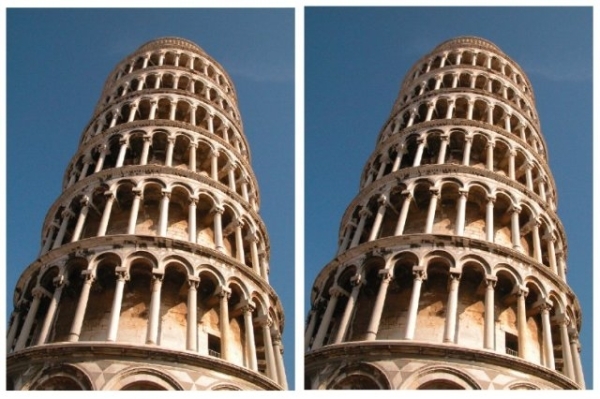 The two images of the Leaning Tower of Pisa are identical, yet one has the impression that the tower on the right leans more, as if photographed from a different angle. The reason for this is because the visual system treats the two images as if part of a singlescene. Normally, if two adjacent towers rise at the same angle, their image outlines converge as they recede from view due to perspective, and this is taken into account by the visual system. So when confronted with two towers whose corresponding outlines are parallel, the visual system assumes they must be diverging as they rise from view, and this is what we see. The illusion is not restricted to towers photographed from below, but works well with other scenes, such as railway tracks receding into the distance. What this illusion reveals is less to do with perspective, but how the visual system tends to treat two side-by-side images as if part of the same scene. However hard we try to think of the two photographs of the Leaning Tower as separate, albeit identical images of the same object, our visual system regards them as the â€˜Twin Towers of Pisaâ€™, whose perspective can only be interpreted in terms of one tower leaning more than the other. For more information on illusions visit http://illusioncontest.neuralcorrelate.com/. Information in this blog post is from http://illusioncontest.neuralcorrelate.com. Also visit leenks.com for other cool stuff. Visit www.leenks.com for funny videoes and pictures.